Popular: fidget spinners make for good prizes, office toys, and saleable novelties. Image by Shiffarigum (via Shutterstock). 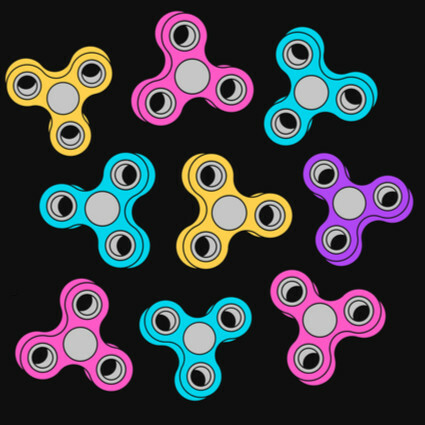 From toy shops to market stalls, in offices and classrooms, and on the trains, fidget spinners have become as ubiquitous as premium priced coffee shops. There are various colours; some have three wheels, others four. Some have flashing lights. We at Novelty Imports have a wide variety for sale ourselves. We offer a range of illuminated fidget spinners with LED lighting. With red, green and blue LEDs, you can change the cell battery should it run out. If you’re fed up with the LEDs, just take the battery out of the fidget spinner. Though fidget spinners have taken the world by storm, they were invented in 1993. Some have regarded them as the “must-have office toy of 2017”. Whatever you make of them, they offer hours of fun. Also known as finger spinners, we sell fidget spinners in packs of 48. Our LED ones are available in packs of 50, 100, and 200. If you buy in bulk, you will save more money. Whether you offer them as prizes, or saleable novelties, they will go down well. Prices start from £57.60 for 48 (price includes VAT at 20%), or £150.00 for 50 LED spinners (again, this price includes 20% VAT). Whether for Christmas fairs, summertime fairs, or amusement arcades, fidget spinners go round and round with the seasons. Whatever time of the year, they are a good all rounder. Novelty Imports, 30 June 2017.